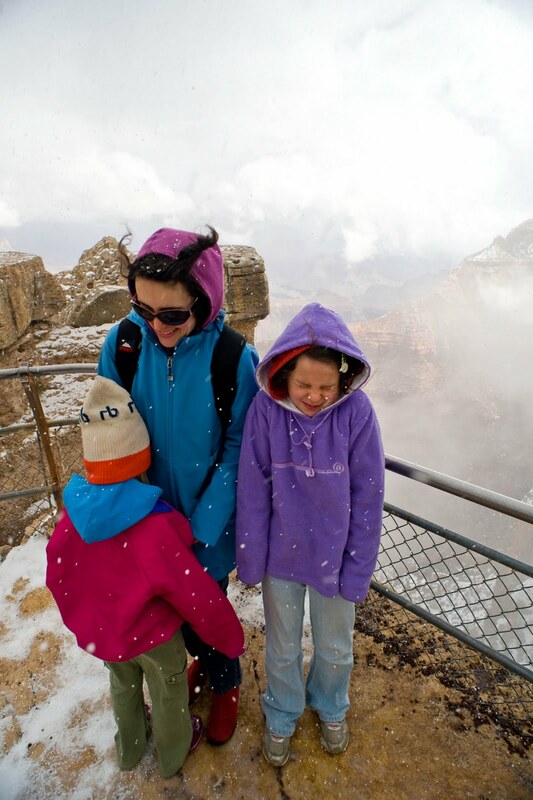 The guidebooks all agreed: May and June are the best time of year to visit the Grand Canyon. So we went in March instead. View here the consequences, minus the skin-chapping, finger freezing feeling of standing in a storm at 6,000 feet. It was unimaginable to the four of us that we would arrive at the edge of the Grand Canyon, and still not be able to SEE it. Every photograph I've ever looked at of the Grand Canyon has it bathed in the perpetual warm light. Over a mile deep in places and 277 miles long, it still seems unthinkable that weather can all but obliterate one of the world's most famous landscapes. Never underestimate, dear reader, the visual obstruction of a good snow-plus-hailstorm. Weather trumps all.